CampNavigator is for all players in the camping industry. Whether its taking a newly established camp to great heights of business excellence, retaining the glory of a well established camp, guiding a child to the best camp to suit his / her needs and wants, or providing quick access to supplies for campers, its the perfect answer. Business Growth with more registrations. Apply to jobs, find the right match and voila-you've got a job! 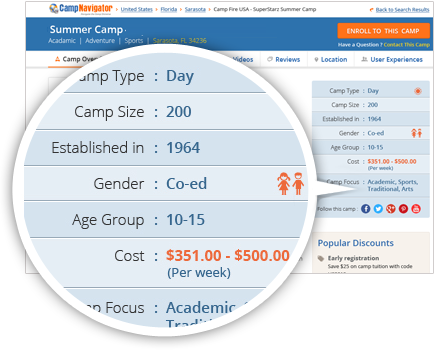 CampNavigator is the perfect online platform for prospective campers and their parents to find the most suitable camps within their budgets. It efficiently and effectively helps parents searching camps that meet the needs of their children. Campers and parents will find a 9 main categories with each one displaying several sub categories of camps to engage your children in useful and multi-purposeful activities to help them become leaders in society. 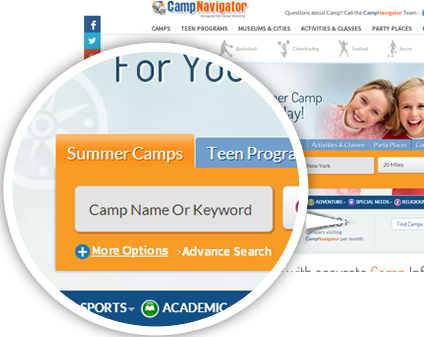 CampNavigator offers Camps an exclusive online platform that showcases their Camp in a way that brings them closer to parents and campers. It multiplies their advertising in a targeted time frame. It helps them manage their recruiting efforts more effectively and efficiently. Many job seekers are highly talented in their respective fields. 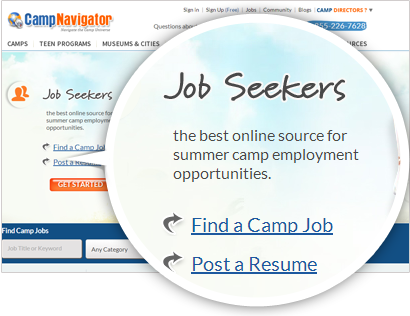 CampNavigator provides them the most suitable employment platform for putting their talents to use, and lets them be active participants in the job search process. It unveils a plethora of employment opportunities in the ever growing camping sector, linking them effectively to camp directors and camp vendors who are looking to fill job openings. 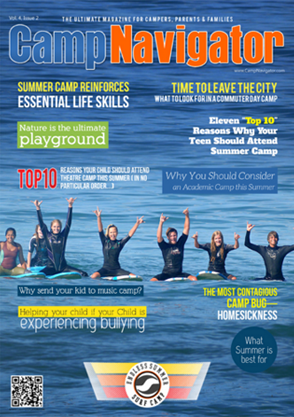 Please read FAQ's on CampNavigator.